Accent body contouring by Alma Lasers is a non-invasive skin tightening treatment that uses advanced radio-frequency technology. Accent Your Body Dual-layer RF Thermotherapy stimulates the production of new collagen and improves skin surface texture. According Accent Your Body website; the Accent Dual-layer RF Thermotherapy stimulates the production of new collagen and improves skin surface texture. Skin tightening treatments with the Accent body contouring system are quick and do not require anesthesia or a prolonged recovery time. Patients can resume their normal activities immediately after the Accent body contouring treatment. 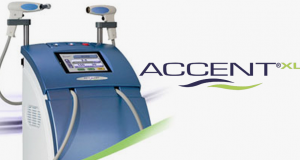 Accent body contouring is a new non-invasive skin treatment based upon Dual-layer RF (radio frequency) Thermotherapy. The Accent body contouring system is the only system on the market using two individual types of radio frequency technology: Unipolar and Bipolar. This unique dual radio frequency technology provides controlled volumetric tissue heating to two distinct depths of tissue. During the Accent skin tightening treatment, the doctor will precisely heat an area of the inner layer of skin (dermis) using radio frequency technology. As the dermis is heated, a natural reaction occurs that promotes the creation of new collagen. The result: a return to the smooth, shapely and elastic skin of your youth. What are the benefits of the Acccent “dual-layer” skin tightening treatment? The Bipolar radio frequency module focuses on the surface layer of the skin, while the Unipolarradio frequency module penetrates further for deep dermal thermotherapy. The Bipolar radio frequency treatment is well suited for areas where the skin is thinner and more delicate, such as the face, helping to smooth fine lines and wrinkles. The Unipolar radio frequency treatment generates alternating electromagnetic fields that cause friction and heating in the deeper tissues, which leads to improvements in overall shaping and firmness. Taken together, these dual-layer radio frequency treatments can create dramatic change without the need for invasive surgery.